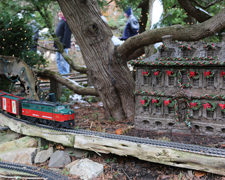 Morris Arboretum's popular Holiday Garden Railway returns with model trains in action, decorated for the holidays with thousands of twinkling lights on an outdoor quarter-mile track. Photo by Mark Stehle. Robin Bloom offers suggestions for holiday fun. Take advantage of free meter parking in Philadelphia on Thanksgiving and after 11am on Saturdays, starting after Thanksgiving through New Year’s. 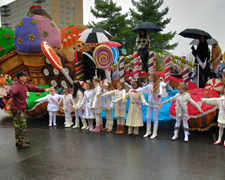 Philadelphia’s annual Thanksgiving Day Parade, in its 96th year as the oldest Thanksgiving Day parade in the country, is Thursday, November 26 beginning at 8:30am at 20th & Market Streets to the Ben Franklin Parkway, concluding at Eakins Oval in front of the Art Museum. Special guests include Dionne Warwick and Son Damon, Viva Mas, Al B Sure, Tichina Arnold, Carli Lloyd, Santa and Mrs. Claus and many more. Also, Disney on Ice. 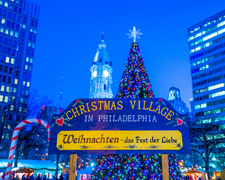 The annual Christmas Village in Philadelphia returns to LOVE Park in Center City on Thanksgiving Day, through December 27, an outdoor German holiday market with vendors in wooden booths offering international seasonal arts and crafts, gifts, ornaments, food and more as well as live performances of local choirs and bands, JFK Plaza, 1500 Arch Street. Free admission. New this year: Lantern Parade and Tree lighting ceremony on December 4 with Philly POPS Festival Brass Quintet, Walnut Street Theatre’s children’s carolers, wine garden, and more. Gingerbread House contest on December 11. Photo by Russ Brown Photography. The Academy of Natural Sciences of Drexel University’s annual Dinosaur Days returns November 27-29, a celebration of the ancient creatures and their closest living relatives – birds – with family activities and educational experiences including live animal shows, games, crafts, story time, and more, along with the opportunity to check out the Drawn to Dinosaurs and Reptiles: The Beautiful and the Deadly exhibits, 1900 Benjamin Franklin Parkway, Philadelphia. Photo by Lauren Duguid/ANS.Can’t make it to Philly? 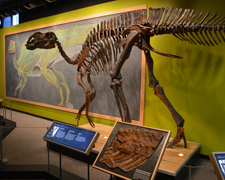 Check out Tiny Titans: Dinosaur Eggs and Babies, a rare look at the life of dinosaurs through their eggs, nests, and embryos at the Delaware Museum of Natural History through January 10, 4840 Kennett Pike, Wilmington. 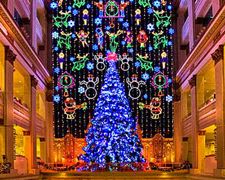 Macy’s Grand Court Light Show returns the day after Thanksgiving through December 31. The show runs every day of the week on every even hour. Also, children’s activities, photos with Santa, and of course, the Dickens Village, 13th and Market Streets, Philadelphia. 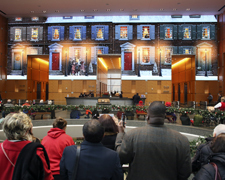 The Comcast Holiday Spectacular returns to the Comcast Center through January 3, shown on the state-of-the-art Comcast Experience Video Wall, one of the largest LED screens in the world, spanning 83.3 feet wide by 25.4 feet high, capturing the essence of the holidays with performances by the Pennsylvania Ballet, Walnut Street Theatre, and more. 15 minute shows begin at the top of every hour, 10am-8pm daily (except for weekdays at 5pm), 1701 John F. Kennedy Boulevard, Philadelphia. Free. Take a photo with Santa on Saturday, November 28 and Sunday, November 29, 11am-3pm. 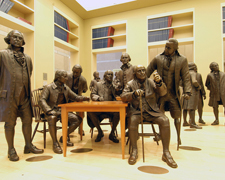 The National Constitution Center’s Thanksgiving Weekend Celebration offers visitors the opportunity to learn about the history of the American holiday, which was approved as national holiday by Congress the same day the articles that would eventually become the first amendments to the Constitution were passed. Check out the “History of Thanksgiving” show, Bill of Rights Show, Founding Fathers, seasonal crafts, a Soldier Mail Call station (to write and send letters of gratitude to men and women serving overseas or who have served), and more, Friday, November 27 through Sunday, November 29 (with extended hours on November 27), 525 Arch Street, Philadelphia. Included with museum admission. All aboard the Santa Express as SEPTA’s specially decorated Christmas trains bring the merry man from the North Pole to Philadelphia’s Dilworth Park on Friday, November 27. 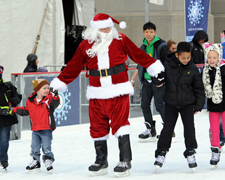 Join in a festive parade to the Rothman Institute Ice Rink, open every day from 11am-11pm. Check website for train times. The Made in Philadelphia Holiday Market at Dilworth Park offers local arts and crafts, through December 27. The official City of Philadelphia Tree Lighting will take place on Thursday, December 3, 6pm in the City Hall Courtyard. Head back to 1840s London and join Ebenezer Scrooge and the ghosts of Christmas Past, Present and Future for the annual Philadelphia tradition of A Christmas Carol, on the main stage at Walnut Street Theatre, November 28 to December 20. The hour-long musical, adapted and directed by Bill Van Horn (who can be seen in the Walnut’s Philadelphia premiere of A Christmas Story, The Musical as Jean Shepherd – also onstage through January 10), is based on the classic Charles Dickens novel and features original music with Mark Collmer as Scrooge, 825 Walnut Street, Philadelphia. For all ages. 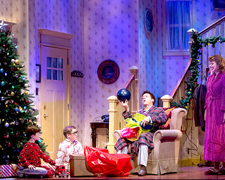 Pictured: Collin Jeffery, Craig Mulhern Jr, Christopher Sutton and Lyn Philistine in “A Christmas Story, The Musical.” Photo by Mark Garvin. Stay up to speed on all things political with 1812 Productions’ 10th annual holiday comedy This is the Week That Is. Written and performed by Dave Jadico, Aimé Kelly, Alex Bechtel, Sean Close, Justin Jain, and Jennifer Childs (who also directs), the show is done in the spirit of The Carol Burnett Show and The Daily Show with Jon Stewart, with Don Montrey returning as head news writer at the anchor desk and Philadelphia’s neighborhood Patsy chiming in! Opening Friday, November 27 through December 31, Plays & Players Theatre, 1714 Delancey Street, Philadelphia. Photo by John Flak. 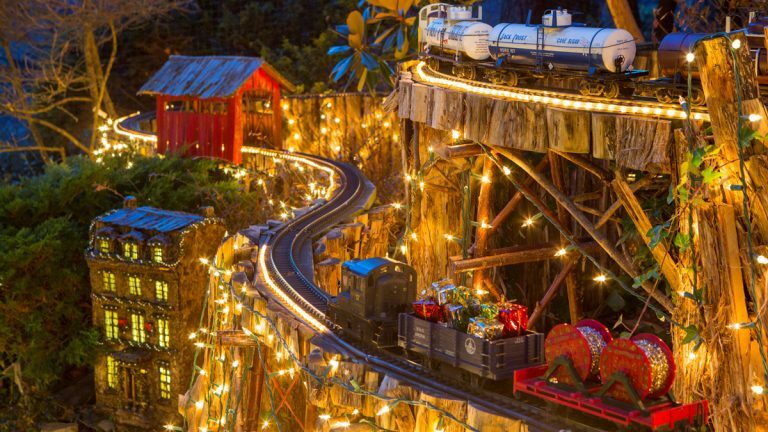 The Morris Arboretum’s popular Holiday Garden Railway Display returns with a quarter mile of track featuring seven loops and tunnels with fifteen different rail lines and two cable cars, nine bridges (including a trestle bridge you can walk under), and bustling model trains. The display and buildings are all made of natural materials (bark, leaves, twigs, hollow logs, mosses, acorns, dried flowers, seeds and stones) to form a miniature landscape with rivers and buildings that are exact replicas of the original including Independence Hall and other Philadelphia-area landmarks, all decorated for the holidays through January 3. 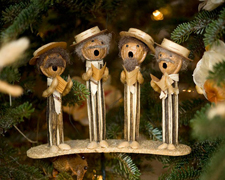 Opening celebration takes place Saturday, November 28, 1pm-3pm, with carolers, ornament-making and more. Back this year is Friday Night Lights, an opportunity to enjoy the display at night on Fridays in December, 100 Northwestern Avenue in Chestnut Hill. Photo by Natavan Werbock. The Brandywine River Museum of Art’s annual tradition of A Brandywine Christmas returns November 27 through January 7 with the O-gauge model train display, featuring nearly 2,000 feet of track, trees decorated with thousands of “critter” ornaments, and antique dolls from the museum’s collection. Related programming and events include Holiday Lights family workshop, November 28, Carols Concert by opera singer Peter Campbell, November 29, December 6, 13, and 20, The Polar Express Read-Aloud Pajama Night, December 3, the annual Critter Sale, December 5-6, ornaments and tabletop decorations made from natural materials, including dried flowers, pine cones, seeds, pods and berries, hand-crafted (pictured), 9:30am-4:30pm, U.S. Route 1, Chadds Ford, PA. Photo by Carlos Alejandro. 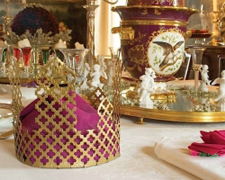 Hagley Museum and Library offers Thanksgiving weekend activities, a celebration of the food and traditions of the nineteenth century, Friday, November 27 through Sunday, November 29, 10am-5pm. Opening this weekend is Holidays at Hagley, featuring the original du Pont family home specially decorated for the holiday season. This year’s display, A Feminine Touch, offers decorations of embroidery and lace, a traditional pastime for the women of the du Pont family and women of the time, through January 3 off Route 141 in Greenville, Delaware approximately 4 miles from downtown Wilmington. 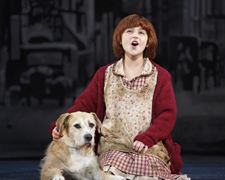 Annie stops in Delaware on its national tour, December 1-6. 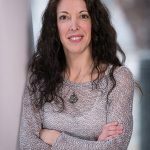 The latest incarnation of the beloved musical about the adventures of a little orphan and her dog, is directed by the original lyricist and director Martin Charnin, with a book and score by Charnin, Thomas Meehan, Charles Strouse. Starring Issie Swickle as Annie, Lynn Andrews as Miss Hannigan, Gilgamesh Taggett as Oliver “Daddy” Warbucks, and Sunny, a 5 year old rescue terrier mix as Sandy with all of the unforgettable songs like “It’s the Hard Knock Life,” “Easy Street,” “I Don’t Need Anything But You,” “Tomorrow,” and more, The Playhouse on Rodney Square, 1007 N. Market Street, Wilmington. Photo by Joan Marcus. 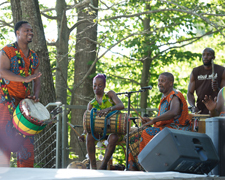 Philadelphia based Kulu Mele African Dance and Drum Ensemble presents music from Africa and the African Diaspora and has commissioned renowned Senegalese choreographer Marie Basse-Wiles to create two all-new world premiere dances based on Senegalese dance and music traditions. Catch Celebrating Senegal, Saturday, November 28, 4pm and 7pm and Sunday, November 29, 1pm and 4pm at the Painted Bride Art Center, 230 Vine Street, Old City Philadelphia. The family friendly show runs one hour and includes a pre-show African Bazaar with an African American Santa. Photo by Christopher Duggan.